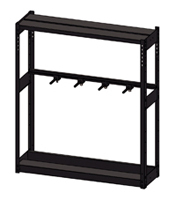 Rails on our mobile units meet ADA requirements. Drastically reduces golf bag put away and retrieval time. Provides optimum ventilation to eliminate mildew. 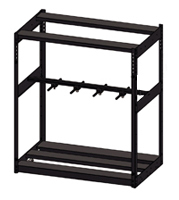 Top shelf is adjustable in height, up or down, to fit difficult storage situations. Angled supports prevent golf bags from tipping or falling forward. Proudly manufactured in the USA with domestic steel. Factory sealed pre-lubricated bearings on wheels - no maintenance. Rigid PVC bag dividers are adjustable by hand to any bag width. All mobile units equipped with rubber bumpers. Installation available by our factory trained employees. Lifetime warranty, best in the industry. Nine standard powder coat colors to choose from. Contact us for a free consultation and analysis of your storage needs. Stores 67% more bags in the same space. 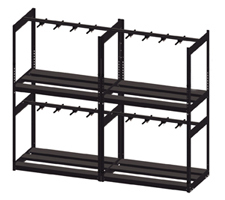 In addition, (2) pairs of End Stops and (2) pairs of Track must be ordered for each mobile unit. 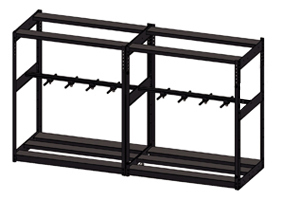 In addition, (4) pairs of End Stops and (4) pairs of Track must be ordered for each mobile unit.